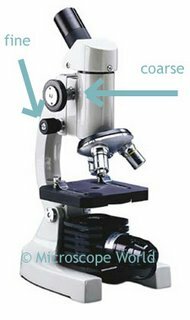 Student microscopes may have coarse focusing only, or both coarse and fine focusing. The National Optical 114-LED microscope is shown below with coarse focusing only. The National Optical 109L microscope is shown below with both coarse and fine focusing. The fine focusing knob makes it easier to really fine-tune the focusing at the higher magnification of 400x. 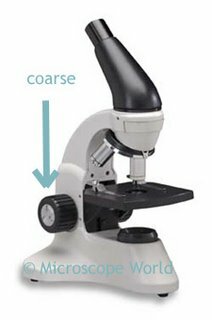 The coarse focusing knob typically moves either the body tube or the stage up and down. A good quality coarse focus should provide smooth movement. Additionally, it is best to use a microscope with rack and pinion focusing mechanisms. The pinion is a toothed wheel that moves along a grooved bar or "rack" which is attached to the stage or body tube. You can learn more about rack and pinion focusing mechanisms here.